Hi, I know I've been offline for a little while, but I'm back with a couple of updates to the site! Check out my new Resources page!! I made a list of most of the tools and supplies I use with each stained glass project. I probably have a few more things to add here, but I hit all the major items. I'll keep it up-to-date, and all the links on that page are to items I use frequently and with which I have personal experience. I'll also try to note which tools are ones I consider essential vs nice-to-haves. I certainly don't want anyone to feel overwhelmed by the amount of Stuff needed to get started, since stained glass already requires more tools than for many other hobbies. There are a bunch of tools on my "wish list" that I don't really NEED (or really have the space for either): a circle cutter, glass saw, an engraving setup, I'd like to try etching or sandblasting... on and on and on! But the reality is that you can have a pretty good initial setup in place for about $250-300. Also keep your eye out on Craigslist; I've seen an occasional ad for the whole setup from a person who is getting out of the hobby and selling everything. I'm also adding three new photos of finished projects to my Gallery page, one is the colorful geometric piece I finished a few weeks ago, and the other two were commissions for friends. Next up, I'll be working on another request from a friend; that one is still in design stages and I'm hoping to start on it in the next few days. This one is hanging up at work right now, along with my small Lemonade panel. The photo doesn't quite capture the colors, and there are 5 or 6 different textures of clear glass used for the background. This was a lot of fun to make, and I got to use up some smaller scrap pieces too. This small panel is for a ballerina of course, and I'll need to do a whole post on this one sometime. I wanted to use the perfect pink for the slippers, but couldn't find just the right shade in the stained glass section. I ended up choosing a sheet of Bullseye Fusible COE 90 glass since it was a solid color and the shade I wanted. I'd been warned that it is harder to work with, and that was no lie. I'll tell the whole story another time, but it ends happy, and I love how the piece came out. This was also done for a friend. She requested a cabin in the woods, with mountains and a purple-blue sky. I of course hit up Google Image search for pix of cabins that I could turn into a pattern, and this is the finished product. I really love when people request specific designs since it gives me a chance to create something I wouldn't have thought of on my own! Again the colors don't look quite right, I'm much happier with them in person. So one theme here is that I need to find a better method of taking pictures of my work. Currently, I am using a lightbox and a point-and-shoot camera - I think my problems come from the LED light in the lightbox - some glass is more opaque than others, so that comes out extra dark on the box, and also the solder lines just look black with the backlighting. We went to a photo salon at a friend's house a couple of weeks ago, so I had a chance to ask some professionals for advice. One suggestion I need to try is to hang a white sheet outside and then hang the piece in front of that. I just need to figure out the logistics of this and then find a nice sunny day to practice. If you have any other ideas for great photos, please let me know in the comments! This one will be a short post; it's 9pm Sunday night and I just finished soldering my latest project. The design was inspired by a postcard I bought once at the Hirshhorn Museum in D.C. (that was a loonggg time ago, I can't even remember when I was there last). I tend to pick up a lot of postcards of images I like, then they sit in a drawer - I came across the stack recently and pulled this one out to turn into a design for a glass project. 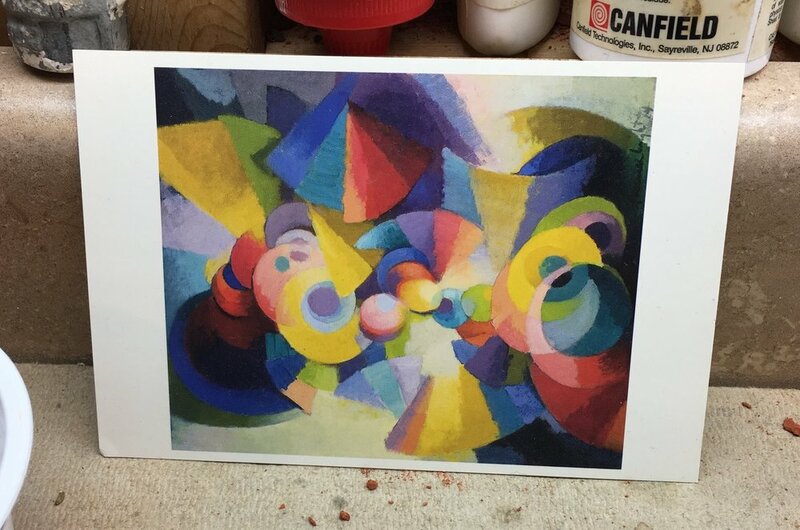 The artist is Stanton Macdonald-Wright; the painting is called Conception Symphony. I didn't set out to copy it, but just make something with a similar color scheme and geometric design. I used a compass, circle stencil, and straight edge to come up with my design. It's important not to let the flux sit on the glass too long since it can stain the glass, and damage any copper foil that is fluxed but not soldered. I use CJ's flux remover to clean the piece after soldering. You don't need much, a little bit goes a long way; I put a little puddle on the piece and then use a brush to clean in all the crevices; then rinse it in the sink. Next time I show a pic of this one, it will be framed! I'm really happy with how the cheerful colors look! Today's post will be a little more rambling than the others; I started typing and ended up with the below. Recently I decided to get a little more serious about my stained glass hobby. I had started out with the goal of making a transom for myself, and loved making it. So I made another, then I made a few panels for family... and eventually I was out of people to make gifts for and out of space in my own house. I kept working on projects for fun, but was just accumulating a pile of completed panels on my workbench, all wrapped up and hidden from view. It started to seem silly to keep making things when they might not see the light of day, so for a while I didn't really make anything at all - but I missed the hobby and so I decided to get back into it and see if I could sell a few pieces. 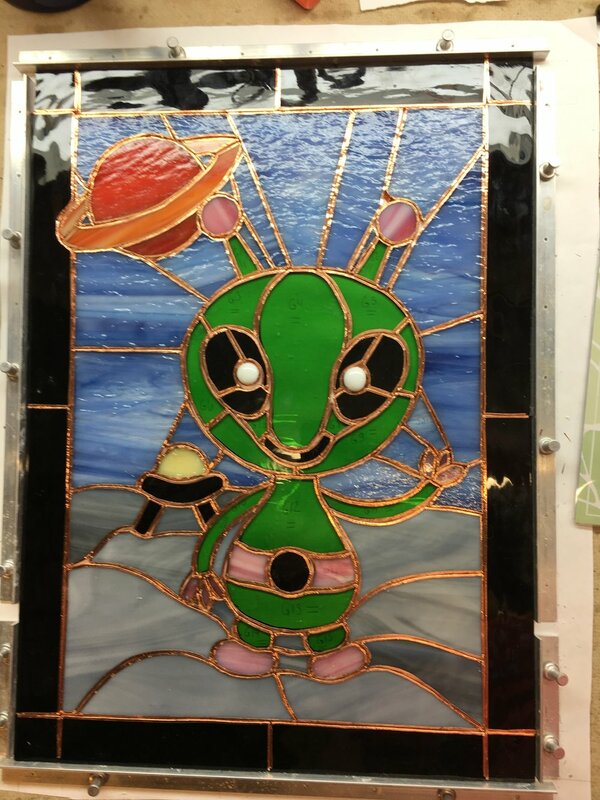 I'm not looking to make a lot of money - nor do I think it would be possible since stained glass projects take so long to complete, but I think it would be pretty cool if I could find owners for my work and a reason to keep playing with glass. 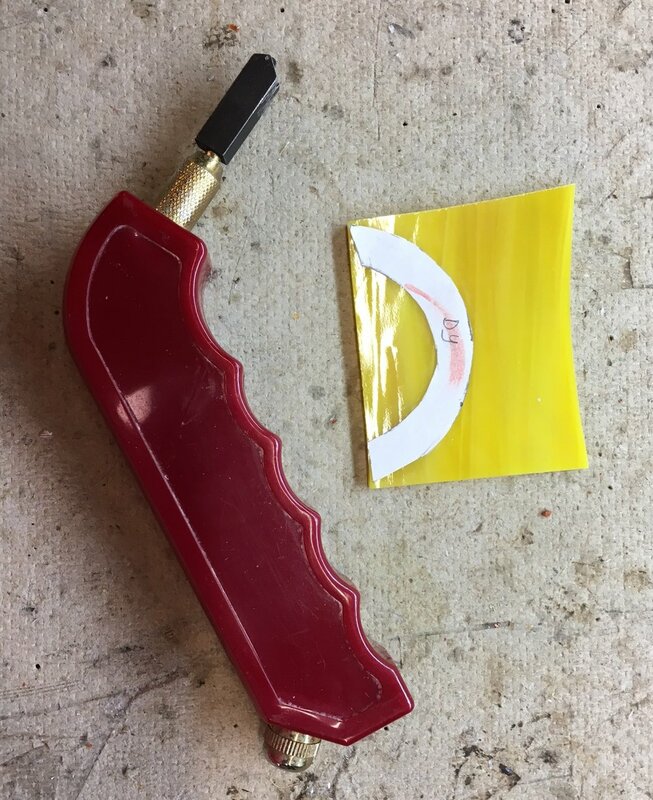 My ultimate goal would be for the hobby to be self-sustaining -- I have some tools and supplies on my wish list, first up being all the supplies I need to get started in fusing glass. And that's where I am now. My workplace allows employees to hang art in our hallways every two months, so I hung four panels in March, and will hopefully have two more ready for May. Of the four I hung in March, two will have new homes soon - I was happy that two people contacted me about buying a panel! And I am currently working on a custom panel for a coworker, which I'll be finishing up this week. I wanted to create a website too. I figured that people could contact me wanting custom work, so I'd need a gallery of pictures showing examples of other work I'd done. And in my searching, it seemed like the Interwebs weren't exactly overflowing with resources for stained glass artists, so I also wanted to start a blog to add to the community. My immediate plans for the blog are to talk about my own projects and things I've learned along the way, but I have some other ideas too, so stay tuned! You'll also get to follow along when I fire up the kiln for the first time, and I'll blog about my learning process when I get started in fusing and slumping. I promise to post pix of any spectacular failures! Right now I'm working on finishing more panels to hang up at work and on finding ways to build an audience for this site. I started reading blogs about blogging and information about SEO in hopes of getting google to notice this tiny site. I created a Facebook page, an Instagram, and added some pins to Pinterest and 'promoted' a few of my favorites - and have been getting some traffic from Pinterest as a result. I have a bunch of other goals too - I'd like to also set up a little Etsy shop and I have a few ideas for products to sell. I'm also interested in creating some instructional YouTube videos. Order Business Cards (sigh.. I am working on this, but I got frustrated with the drawing programs and put this on pause... the design is just not coming out how I pictured it in my head) -- I wanted these by May 1 so I can include them with the deliveries of the panels people bought from me. Find two ways to "market" this website - I will count my Pinterest promotions as one of these. Buy supplies to get started in fusing - I think this one is just going to be on hold for a while... we still need to do some rearranging in the basement to give Esmeralda a nice home, and there is a lot of other non-glass stuff on our to-do list too. That's ok though; I wasn't planning to buy the kiln until the Fall, but went ahead and snapped up a good deal on Craigslist last month. Lastly, I want to figure out a good and repeatable way to etch my name or initials in the corner of each piece. I was going to try to get this sorted out for the two pieces I'm working on, but I am not ready to try on a real panel yet... maybe next month. Here's a section of the ballet slipper panel I'm working on for my coworker - I don't want to share a whole picture until she receives it! I'm also very happy that Spring is here, which means it is time for my very favorite hobby, sailing! Glass has become more of a winter hobby for me, since the warm-weather months are taken up with sailing. We have been working on the boat to get it ready to splash soon, and in the meantime, I'm sailing with my local sailing club. So, I'll be spending less time on indoor hobbies for a while. I still have plans to work on some of the projects on my wish lists, they'll just take longer than they normally would. And I have a bunch of ideas for blog posts, so they will continue to roll out, just maybe more slowly than they will in the colder months. This is part of a series of posts about tips I've learned while working on my projects; hopefully they will be helpful to those just starting out. These lists aren't meant to cover everything, and if you have additional tips, please share in the comments! Last time, I talked about glass cutting; the next step after all your pieces are cut it the grinding. 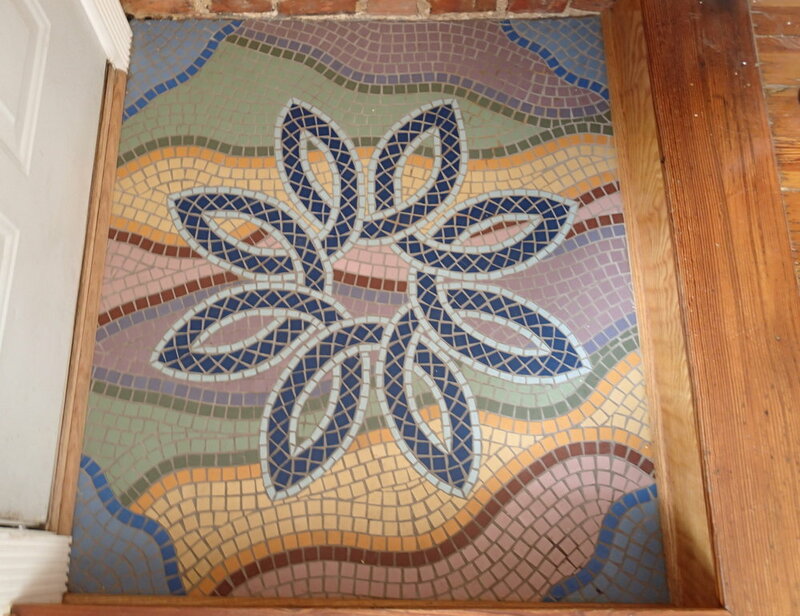 This topic should be relevant whether your interest is in stained glass, fused glass, or just in using stained glass sheets in your mosaic projects. Of course, the number 1 essential tool here is a grinder. I'm sure many grinders out there work great, so I'm not suggesting one over another, but the only grinder I've owned is my Gryphon Gryphette grinder, and it is great! It's small, but I haven't found that it's too small for any of my projects, and it's perfect for my small workspace. You can buy an optional face shield that will mount over the work area; I don't have it, but I always wear safety glasses. In fact, I store them as shown in the picture; on top of the grinder - that way I never forget to put them on. It's super important to wear them, as little shards can fly around, especially for certain textured glass, and especially when you have a new bit. I like my eyes so I never grind without my safety glasses! I clean out the water reservoir of my grinder every 4 or 5 projects. It always amazes me the amount of glass dust that collects in there. The grinder is the main tool you need, but it needs new bits sometimes. I use these bits for my grinder, and they last a good long time. You also need good old H2O to fill the water reservoir (you can see my old Nalgene bottle in the background here. Our slop sink is in an inconveient spot, so I use it for my water needs while working. And last, you need little bits of sponge to insert behind the grinder bit to keep everything wet while you're working. My first tip is in the order of the pieces you choose to grind. You're always going to have to do some touching-up to make all of the individual pieces fit together well, but the main pieces of your design will need to have specific shapes in order for the panel to come out the way you want. So, I always start with the "essential" pieces to grind first, and get those to look exactly how I want. Then, I grind the ones that are part of the background - and if they don't fit perfectly in their spots, I can always remove a little here or there and it doesn't matter since it was just a background piece anyway. For example, check out the piece to the right, which had just gone through the grinding stage when this photo was taken. I ground the sun, boat, and frog first, then made the background yellow/orange, blue, and green fit around those main areas of the design. Would it be faster to cut away or grind out that inner curve? This is probably more of a cutting tip, but one thing I find to really speed up how quickly I can make a project, as well as minimizing cost (grinder bits are pricey! ), is to really make sure I've cut away as much glass as I can before I grind. I want to make sure I only have to do a quick pass with the grinder to remove those sharp edges, and MAYBE do a little extra work on a tricky inner curve. 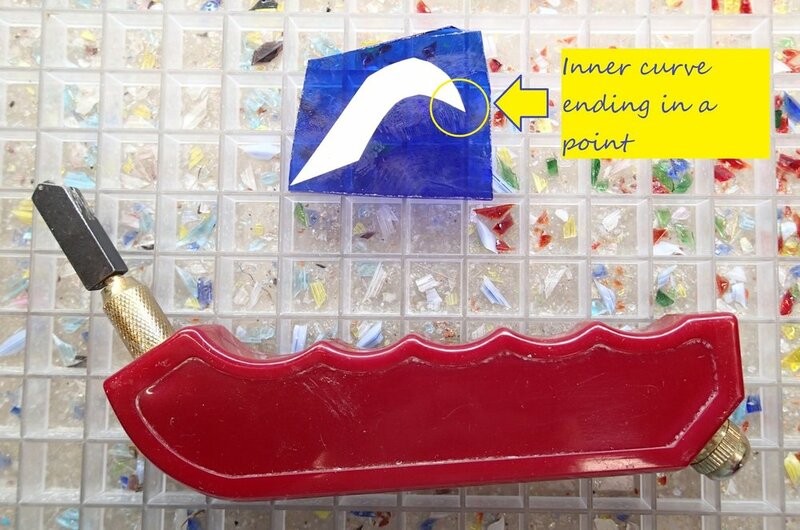 But poking around on YouTube, I found videos that tell you not to even try cutting away the glass on an inner curve, and instead to grind out the whole area! You'll go crazy, it will take forever, and your husband might threaten your life if you don't make that grinder noise stop! (The last happens often enough to me even with my strategy to maximize cutting and minimize grinding...) Take the time to get comfortable with glass scoring and breaking, trust me, it will be worth it! Grinding bits wear out, but they do so slowly, so sometimes I don't notice that the area of the bit I'm working with is getting dull until it's doing nothing at all. I usually put on a new bit so that the bottom part is the grinding surface, then slowly move it down the shaft as it gets dull. Grinding bits rotate counter-clockwise on the grinder (at least on mine, and google says this is how most of them work). So, if I am pushing my piece to the left under the spinning bit (against the direction of spin), it will grind away more of the glass than if I push it to the right, with the direction of spin. This is useful to know, because if you have a big chunk of glass to grind out, then going against the spin will have more of an effect than going with the spin. And then do the opposite when you're mostly done but just want to take that final smoothing pass. 5. Perfection is the Last Step! Last tip - as you are grinding each piece and fitting them together, don't worry if it's not perfect. I'll do my first pass at grinding, and often still have a bunch of pieces that aren't fitting nicely. Once I've given each piece one go at the grinder, I'll look over the whole thing and figure out where I still need to trim away some glass. By waiting until the end, I find that I can make sure I'm trimming those background pieces and not the ones where the shapes are more critical. Those are my top 5 grinding tips! The final step after I finish grinding a piece is to see if it fits in the bigger glass puzzle; before I do that, I always dry it off so it doesn't get my pattern paper all wet and blotchy. And I keep a Sharpie close by; if I end up needing to trim a piece down in multiple spots or don't want to lose my place, I'll mark the problem area with the Sharpie, do another grinding pass, and usually the water in the grinder is enough to clean up that Sharpie line. My husband and I had moved into our Baltimore City rowhouse (complete with a mosaic entry floor I made), and had a plain glass transom above both the front and backdoor. Many rowhouses in the city have a colorful stained glass transom with the house number in the glass above the door, and we wanted our house to have one too. My husband suggested that I should take a class to learn how to make a transom with our house number for us - so a few months after moving in, I did. I found an introductory copper foil class at The Glass Key, which met one evening a week for 6 weeks. We completed a basic project in that time and gained the skills needed to do more projects. As part of the class, I bought a basic toolkit and bought my grinder the night we learned to grind. I loved the class! We had "homework" each week to complete the step we had just learned so we could move on as a group together the next week. Now I'm the type of student who always does her homework, plus I was motivated to learn so I could work on my transom project. I'm not sure why all the other students were there, but let's just say they weren't as conscientious... the second week, I was made fun of by the others since I was the only one who completed the assignment! Sigh. Here it is, my very first ever project, in all it's uneven-lines,, badly-cut, bumpy-lumpy-solder glory. This was our practice piece, and at each step, we'd make a mess out of this sad little square before continuing on to our 'real' project. I couldn't decide what our transom design should be. I looked online at pictures of others that I liked, and ultimately drew a simple geometric design that I hoped wouldn't be too hard for my third real project. I thought it wouldn't be hard, but it turns out I didn't plan it very well- my design involved having to cut half-circles into several pieces of glass, and this was not easy for a beginner! I kept breaking the glass in bad spots and having to start over again. I ended up ruining enough of the clear pieces that I had to go back to the store for more glass. .. but eventually, through a combination of careful cutting and more grinding than anyone should ever do, I got them done. However, the clear glass I was using was textured, and the texture had a orientation. But since I had to repeat so many of these pieces, somewhere along the way I screwed up and turned one 90 degrees. But I didn't notice until I was almost done, so it is still in there! You can't tell unless you get up close though. The very last step was to install my framed piece in the transom. But I must have gotten a measurement wrong, and it was just barely too big! My husband ended up sanding down the zinc frame on the bottom where it would be least visible, and got it installed. This is the actual picture; its hard to get a pic from the front. ...and here's the flipped pic; this is how it looks from the front of the house. After I completed this project, I went on to make another transom window for our backdoor, and a variety of other panels for gifts or just for fun. It's been 6 years since that first class, and I've acquired a bunch of new tools, have tons of ideas for future projects, and most excitingly, I am going to get into fusing and slumping soon! K: You named your kiln? Me: Of course, wouldn't you? K: Um, no. The lathe is just called "the lathe". 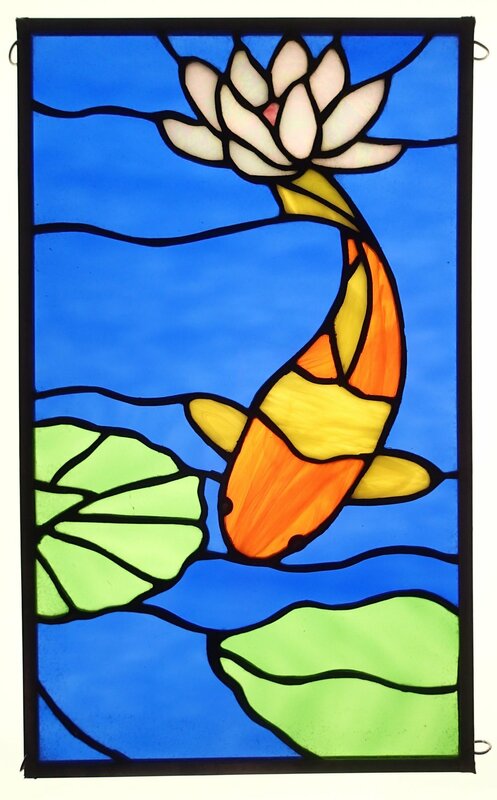 Share your first project or why you decided to learn stained glass in the comments! 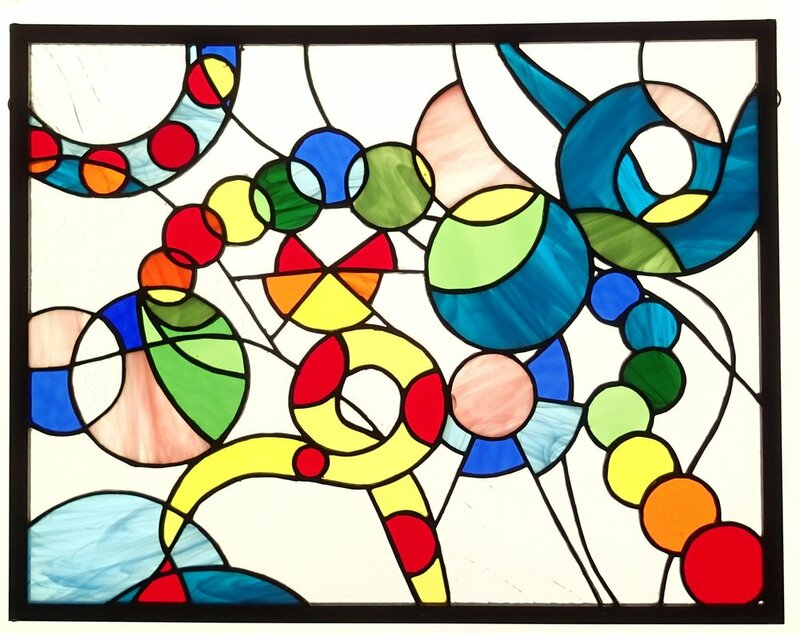 This topic should be relevant whether your interest is in stained glass, fused glass, or just in using stained glass sheets in your mosaic projects. First, lets start out with the tools you need. It's not much! I have found that I can do everything I need with the three tools in the picture. One of these days, I will get one of those fancy schmancy glass saws (and don't worry, I will blog ALL about it! ), but for now, I am doing everything the old-fashioned way. I am using a grip cutter, running pliers, and breaker/grozer pliers. Those three tools together will cost about $40. In addition to the tools, I also find that a waffle grid like that in the above picture is super-helpful for keeping glass shards <mostly> contained and to help avoid injuries. I didn't have one at first, and find it to be useful for two reasons. First, the shards fall into the grid, so you're not as likely to end up with them under your skin, on the floor, or underneath the glass you're scoring (and then scratching the bottom or worse, causing your glass to break). Second, a lot of times, you need to make a long straight score in a piece of glass. If I can see through the glass, I line up where I need to make the cut over one of the lines in the waffle grid - giving me a line to follow. Go slow and don't try to do too much in one cut, unless it is a straight line. This doesn't come naturally if you're impatient like me, so I've had to learn this lesson a few times. If you're cutting any kind of curve, make sure that any one score isn't too complex. My first "real" project - those half-circles I had to cut into the clear pieces were a pain! This also goes back to your design-- don't make the same mistake I did and draw a first design that involves cutting half-circles into your glass! 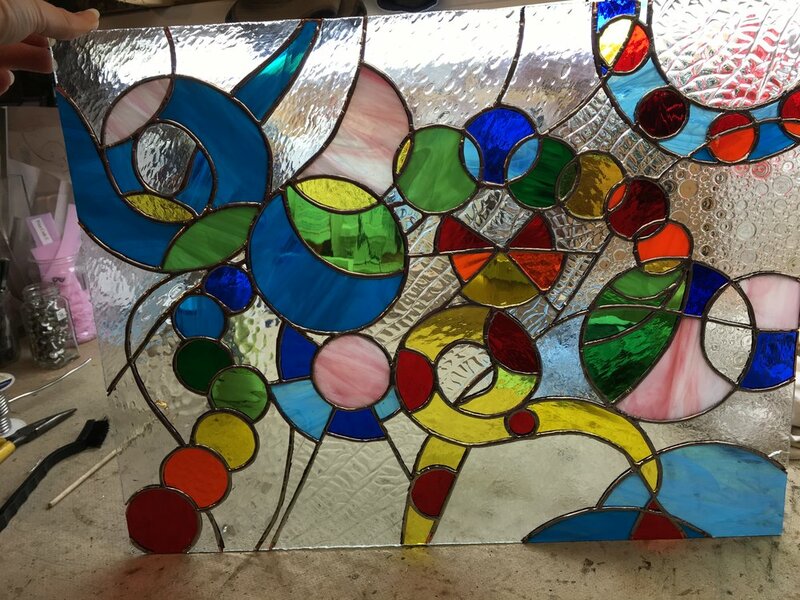 It's definitely possible to be able to do that with the tools I have, but it's tough and requires a LOT of patience to slowly score more gradual curves and chip away the glass, a piece at a time - and wasn't easy for a beginner. That glass saw will open up lots of new possibilities, but I have found that with a combination of careful design and patient cutting, I have been able to accomplish almost everything I want. Too many sharp inner curves in one piece of glass has been a recipe for disaster for me. I always do a final pass over the drawing to look at each individual piece, after all the lines are in place to double check for anything that would be un-cuttable. Even after doing this, I'll sometimes still find a hidden scary curve when cutting out the pattern. This happened with my alien panel, I'd originally had the sides of the face drawn as one piece instead of two. This one worked just as well with cutting each of them in half, so I did. To the right is a photo of the lemon rind from the lemonade panel - I wasn't sure if I'd be able to make this cut or not, and had a backup plan of splitting the rind into two pieces if needed. But by slowly scoring and chipping away at the glass, it worked out! Lastly, if you're cutting an inner curve that will end in a point, I find that it usually works better for me if I cut the curve first, while there's still some extra glass hanging out on the other side of the point. This is hard to explain, so see the pic at the right. I first started working on the inner curve, then removed the glass to the right of the point. Scroll thru the pix below to see the order of my steps. That's it for today - if I think of more essential cutting tips, I'll add another post. If you've got anything to add, please share in the comments! This post contains affiliate links, and if you make a purchase by clicking on affiliate links, I will receive a small commission. All links will be for products that I have personally used and recommend, and profits will go towards maintaining and improving this site. The last post covered some design tips; today, I want to post about turning a photograph into a stained glass panel. This same technique would work for a mosaic or another craft too - it's all about turning a photo into a simple line drawing that you can work from. For this project, I'm going to work with this photo that I took this on vacation in Greece, on the island of Kos. We were on a guided tour, and stopped in Zia to see the town and have lemonade. 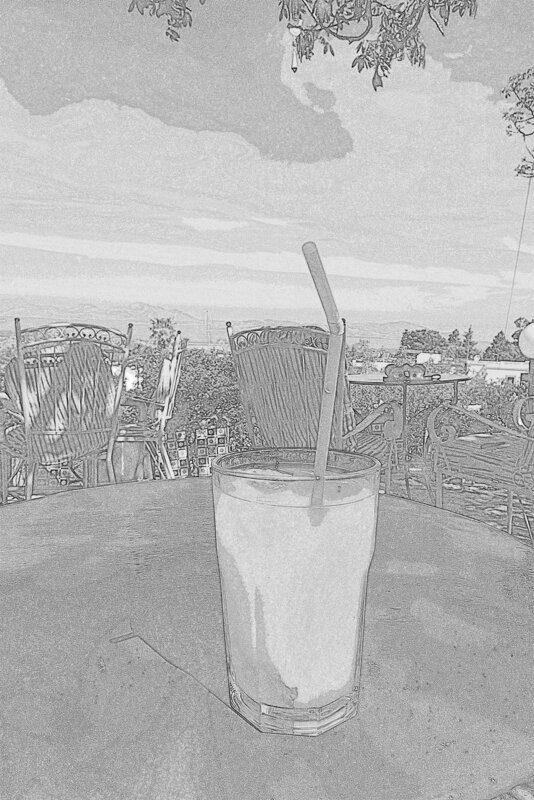 The photo is of my glass of lemonade, with the Aegean Sea and Turkey in the background. I love the colors in this picture, and it always reminds me of such a great day; I have been wanting to turn this photo into a glass project for a while! Here's my black-and-white, borrrrrring picture! time to turn that into shiny colorful glass !! Now, print out that line drawing, and trace the significant features onto a new sheet of paper. I used my light box, shown in the photo to make the tracing easier. If you don't have a light box, just outline the significant features of your photo with a Sharpie and then you should be able to trace it without the backlighting. Here's where you get to take some creative license! Want to move a background element to a different position? Add a lemon slice on the rim of that glass of lemonade? (I see a mint leaf on the bottom of that glass, but I wasn't about to attempt turning that into glass - it might end up looking unappetizing! But I still thought it needed a little something-something, so I added a lemon slice!) Go crazy here! Pencils have erasers for a reason, you can always 'undo' your changes. So here is the design I turned my photo into, after some trial and error (this is the final copy, and doesn't show all the eraser marks!). I moved the glass to the left, deleted Turkey (sorry, Turkey...) from the background, changed/simplified the colors, added my lemon slice, etc. Now it is an 88-piece stained glass panel. Step 3: Choose Glass Colors and Make Your Panel! For this image, it was really easy for me to choose colors - given the photo, I knew I wanted bright yellow lemonade, a sunny sky, and a red tabletop. So, here it is, turned into glass (cut and ground, not yet foiled and soldered). What do you think? What would you have done differently? Would you have changed some of the coloring, kept the background islands, added a flower vase?? The possibilities are endless! I think it would be awesome if one of my readers reinterpreted this photo for themselves - if you give it a try, please post a pic or link in the comments! And here is the finished piece! This one went pretty fast, from photo to framed piece ready to hang. I'm starting a series of posts about tips about how to make stained glass that I've learned while working on my projects; hopefully they will be helpful to those just starting out. These lists aren't meant to cover everything, and if you have additional tips, please share in the comments! Today's entry will focus on designing your piece - there are a few things you can do upfront while you're laying out your design, to make things easier in the cutting step to follow. Of course, you can always find a pattern in a design book, and I definitely recommend that as a way to get started - but I've always been more interested in creating my own designs. For me, my first two pieces, done in a class, were from patterns, but my first 'real' panel was a stained glass transom for our house - so it needed to be a custom size and work in our house number. My number one tip is to keep it simple simple simple, especially at first. Think coloring book drawing for a small child simple! The more details, the more pieces and the more complexity. And the simpler the drawing, the easier it will be to spot those difficult or impossible to cut areas. 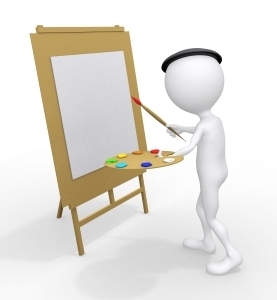 For those that are artistically challenged, like me, here is my secret: when I have an idea of something I want to create, my first stop is to look at free clip art images online. I will look for one or two that I can resize and put together to fit my purposes. This step usually involves printing and photocopying the images at different enlargements and putting them together. Often I also need to simplify the pictures - removing details and softening lines to make it easier to turn into glass. Then once I have the arrangement I want, next step is to decide how to turn it into pieces of glass and determine where the solder lines will fall. This will be different for every image, but try to break up the picture in places where it makes sense. Tip 3: Background Lines are Important in your Glass Piece! For the background of your piece, consider where the solder lines will be and if they should be straight, wavy, or organized in some way that will strengthen the design. Here's another example - in this one, I decided on wavy lines for most of the sky but straight lines radiating from top of the lighthouse. In general, I tend to use wavy lines for sky, water, earth backgrounds. Finally, I wanted this circular piece to be totally symmetrical so I made sure the background solder lines would be in the exact same spot for each flower. I love symmetrical designs, and having the background also be symmetrical is pleasing to the eye! I'll add more posts about my design process later on - my next post will talk about turning a photograph into a stained glass panel. For now though, do you have any tips or ideas to share? Add them in the comments! A few years ago, I had an idea to make a bunch of small turtles for my coworkers, to commemorate wrapping up a big project. I found an example of something close to what I was envisioning on Pinterest, and modified it a little. 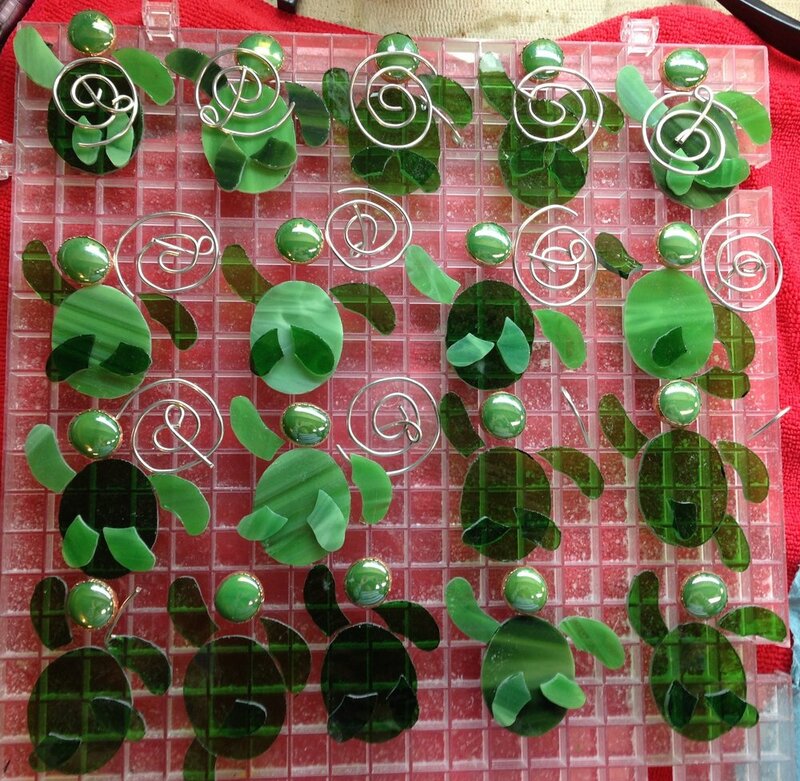 I had a bunch of green glass leftover from other projects, so I started out by making one as an example - and once I was happy with the design I turned on some music and set up my turtle assembly line. Each turtle required 5 pieces of glass (body and 4 legs), so first I cut the shapes out of paper for tracing. For the heads, I used little glass gems. 1. 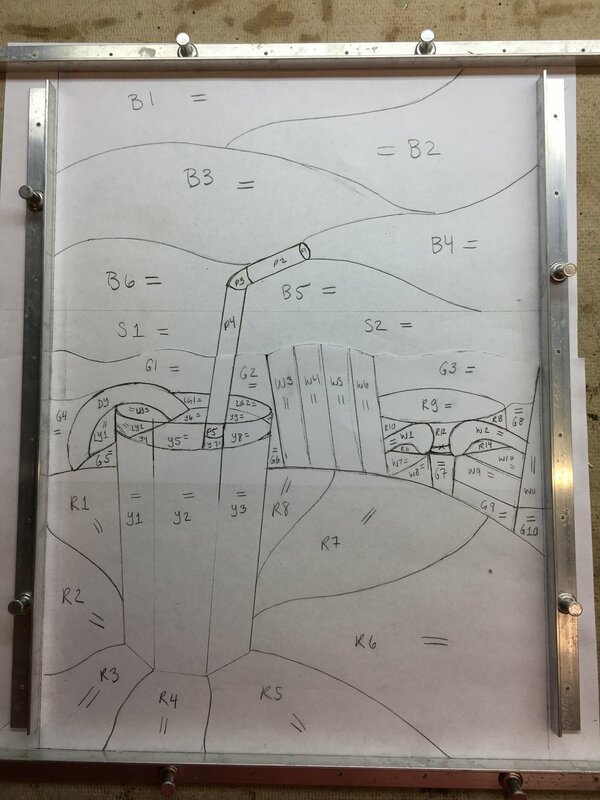 Tracing: I cut out one design and traced the outlines of the pieces using a Sharpie on the glass. 2. Cutting: I cut all 125 pieces, and made little piles of body parts for assembly. 3. 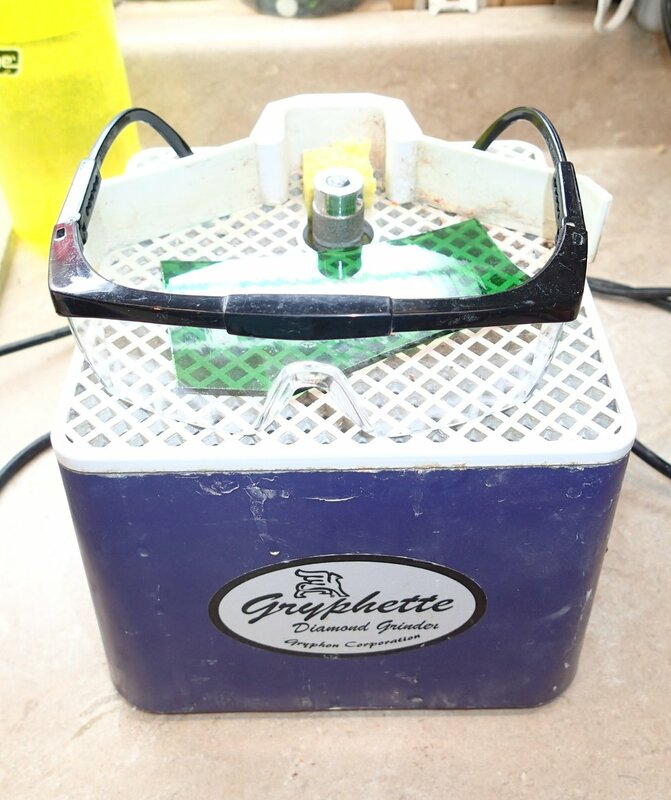 Grinding: I ground all the glass and used the grinder to scuff the edges of the gems so the foil tape would stick. 4. Foiling: Definitely needed a podcast to alleviate the boredom of this step. 5. Wire: I added a wire spiral to the front of each turtle body, so next step was to bend a piece of wire into a spiral, and make a second smaller piece to use as the hanger on the backs. So 50 cut and shaped wires. 6. Soldering: I set up about 8 turtles at a time, fluxed, and tack-soldered them together. Then I fully soldered them, using a vise to hold them to complete the edges. I also made 2 drips of solder on the top of each head to represent the eyes. I really should have kept track of how long all of this took, but since it was easy to put in 30-60 minutes at a time when I could, I didn't track it. It didn't feel too tedious though since the steps moved pretty quickly. Soldering was the exception to this - this seemed to take forever, especially the edges since I had to keep moving the pieces around in the vise, being sure not to touch the hot area I'd just finished. But they were done in plenty of time to hand them out, and I tied a little ribbon and name tag to each wire hanger. Sometimes now I see them on people's desks when I go visit my coworkers from that time- and of course I made an extra one for me to keep for posterity! Have you ever mass-produced an item for gifts to a group? Alien Encounter is done! The last steps I needed to complete, Sunday, were to add the frame and hanging materials. I wanted to finish this one so I can bring it in to work this week, along with three other pieces, for hanging in our employee art show. Now, I didn't HAVE to finish it today, there will be another show in a few months. But I was so close so I wanted to get it done. I almost got in my own way of finishing it though - I didn't have quite enough of the zinc came to frame it, so I stopped by the supply store I like earlier in the week to buy another piece. Yesterday, I was happily framing along, and had 3 of the 4 sides cut from the zinc I had on hand when I had to move to the new piece. Turns out though that I accidentally bought the wrong size! (3/8" instead of 1/4") My first reaction was disappointment that I wouldn't get the project done since it would involve another trip to the store - which is closed on Sundays and Mondays. But then I realized that I could just start over with the larger piece and make all 4 sides again from the wider material. I had re-doing things, and I don't like wasting materials, but it was the only thing standing in my way of getting this piece completed, so I went with it. Another part of my mental block with starting over was that it felt like it took SO LONG to cut the first three sides. But I had a feeling the saw blade might be getting dull, so I went ahead and changed it before I started up again. Wow, what a difference! I hadn't realized it but the old blade was pretty dull - and the new blade went through the zinc like butter! I was cackling away while I zipped through that came and got the new frame cut and taped into place. First, I cut the zinc came on a 45 degree angle and taped it into place with masking tape. Next, in each corner, I used masking tape to block off the square where I would solder the zinc pieces together - this keeps the solder contained to that square area and it looks neater. Then I fluxed and soldered each corner, and each place where a solder joint met the frame. One area I'd like to improve on is to be a neater solder-er, it's hard to get it flowing just right! To get the square nice and flat, I held the soldering iron nearly horizontally to flatten it out. Repeat on each corner, and, ta-da, she is complete! I just added two steel rings on either side of the frame for the hanging wire, and it is all done. I'm including two pictures, because I had a really hard time getting a good photo of this one. The one to the right is on my light box, and the one below is without the back-lighting, but neither really show the true colors. Add improving at photography to my list of goals for this site! Does anyone have any tips for getting good photos of stained glass work? If so, please share in the comments! My first post, how exciting! I figured a good topic for a first post would be the project I'm currently working on (and nearly done!). I wanted to do something a little different, so I decided on a friendly alien. In the picture, she has been completed up through the copper foiling step. I used little white glass nuggets for the eyes, and later realized that if I had planned the design better, I could have used larger nuggets for the antennae and middle of her belt, which would have added a cool touch. I'll have to remember that if I make a similar design again..
What are you working on right now? I'd love to hear from you in the comments! My Stained Glass website, with images of my work and a blog about projects I'm working on, and tips and techniques.